Please join us for Zumba and fun to benefit a great cause! Team Teal Hope is hosting a Zumba fundraiser in memory of Susan (Hunt) Means. 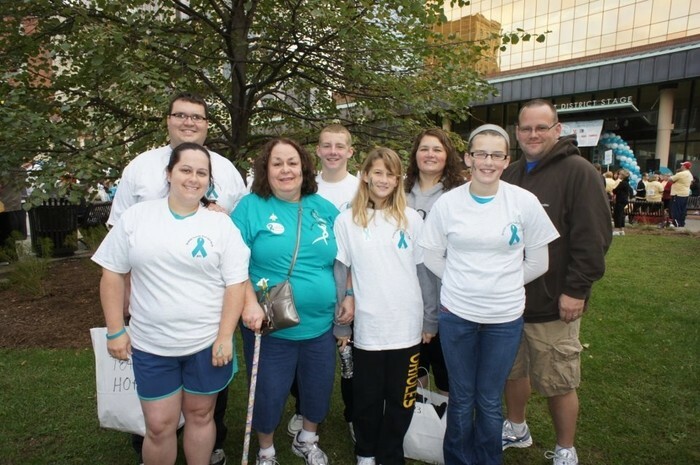 Susan fought a hard battle with Ovarian Cancer and was a 7 year survivor when she passed away April 30, 2012. We miss our mother dearly and we wish she could be here to watch our families grow. We do this walk every year and this organization is very near and dear to our heart. Please join us in the fight against Ovarian Cancer! All donations will go directly to Ovar'coming Together to fund Ovarian Cancer awareness, survivor support, and research. Join us for a fun time and bring your family! We will have a Zumba class taught by Heather Nimz Green at The Indianapolis Star building in downtown Indianapolis. DONATIONS ACCEPTED TO PARTICIPATE. Free parking will be available in The Indianapolis Star garage located on Delaware St. Go into the employee entrance doors and someone will be there to guide you to the 6th floor community room. The fundraiser will start promptly at 10am on August 31st.